Jordan B. Noble, or “Old Jordan,” as he was called, leads the town’s annual parade commemorating the battle for ownership of New Orleans. He was only fourteen years old when he played the drums to rally the troops during the series of battles that began in December of 1814 and ended in January of 1815. Born free in Georgia, Jordan later moved to Louisiana and went on to serve in both the Mexican War of 1846-1848 and the Civil War. At first glance, members of today’s politically correct society might be alarmed at the illustrations, but the illustrator is actually attempting to depict the diverse group of soldiers who banned together, under the leadership of Andrew Jackson, to defeat the British army. There are Native Americans dressed in what could be described as stereotypical garb (i.e., feathers and buckskin) that may not have been worn by Chocktaws. There are Baratarian pirates and Cajuns too, easily discerned by the costumes they wear. They are all former soldiers who have come to join Jordan’s parade. 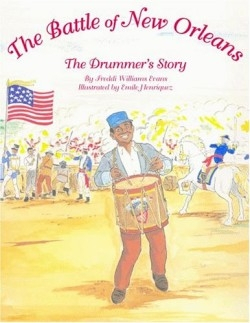 The illustrator, a native of New Orleans, now lives in Slidell, Louisiana and has illustrated several children’s books about a precocious boy named D.J. : D.J. and the Zulu Parade, D.J. and the Jazz Fest, and D. J. and the Debutante Ball. His efforts here depict a proud and multicultural community of ex-slave, Haitian, French, Spanish, and German men who come together once a year on January eighth. The book is written in rhyming couplets, and a few of them seem forced, with the length and pace of the lines sometimes incongruent: “Rat-ti-ty tat, rat-ti-ty-tat, did-dle, did-dle, dee— / If I really had his drum, a great drummer I would be.” The author, a native of Mississippi, resides in New Orleans. She received a dual undergraduate degree in piano performance and psychology from Tougaloo College in Tougaloo, Mississippi and a Master’s degree in Creative Arts Therapy from Hahnemann University in Philadelphia, Pennsylvania. This is her second book; her first, A Bus of Our Own, was published in 2003. Although an author’s note would have been helpful, there is a brief glossary concluding the book. This volume adds a worthwhile chapter to one story in America’s history, and young readers (ages 5—8) will find the war scenery, artillery, horses and patriotism engaging.